CBS, the top-rated network in daytime for 29 years, has renewed its entire Daytime schedule for the 2016-2017 season. 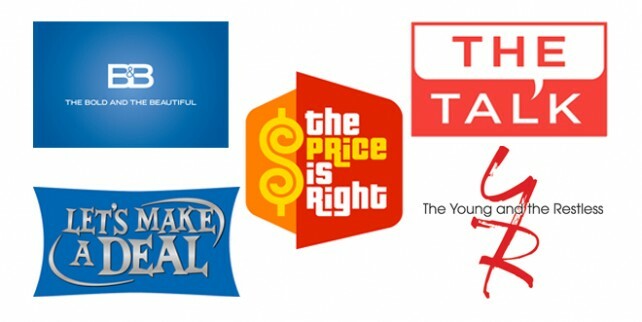 The lineup, nominated for an industry-leading 60 Daytime Emmy Awards collectively, includes Let's Make a Deal; The Bold and the Beautiful, which received a two-year pickup; The Talk; and The Price is Right and The Young and the Restless, which both previously received multi-year pickups through the 2017 season. This season, CBS Daytime saw its viewers increase +2% over a year ago. Let's Make a Deal, with Daytime Emmy Award-nominated host Wayne Brady, will return for its eighth season. Let's Make a Deal 1 is averaging 3.33 million viewers, up +3% from last season while Let's Make a Deal 2 is averaging 3.72 million viewers, up +2%. Produced by FremantleMedia North America, the show is broadcast weekdays (check local listings) on the CBS Television Network. Mike Richards, Dan Funk and Jennifer Mullin are executive producers. Let's Make a Deal is currently nominated for two Daytime Emmy Awards, including Outstanding Game Show and Outstanding Game Show Host. The 44th season of The Price is Right 1 is up +4% from a year ago with an average of 5.13 million viewers while The Price is Right 2 is up +3% with an average of 5.88 million viewers. Daytime television’s most watched daytime program, hosted by Drew Carey and produced by FremantleMedia North America, the program is broadcast weekdays (11:00 AM-12:00 PM, ET/10:00-11:00 AM, PT) on the CBS Television Network. Mike Richards and Jennifer Mullin are executive producers. The Price is Right is currently nominated for two Daytime Emmy Awards, including Outstanding Game Show. The #1 daytime drama for 27 consecutive years, The Young and the Restless, is averaging 5.28 million viewers, up +1% from last season. The series is broadcast weekdays (12:30-1:30 PM, ET/11:00 AM-12:00 PM, PT) on the CBS Television Network and is produced by Bell Dramatic Serial Company, in association with Sony Pictures Television. The Young and the Restless is currently nominated for 27 Daytime Emmy Awards, including Outstanding Drama Series. The Bold and the Beautiful, which recently celebrated its 29th anniversary, is averaging 3.94 million viewers. The most-watched dramatic serial in the world, The Bold and the Beautiful is a Bell-Phillip Television production, broadcast weekdays (1:30 PM-2:00 PM, ET/12:30-1:00 PM, PT) on the CBS Television Network. The Bold and the Beautiful is currently nominated for 23 Daytime Emmy Awards, including Outstanding Drama Series. Currently in its sixth season, The Talk is network television’s #1 daytime talk show, averaging 2.77 million viewers, up +2% from last year while remaining even in women 25-54 (1.0/06) and women 18-49 (0.7/05). Recently, the series won the 2016 People’s Choice Award for “Favorite Daytime TV Hosting Team” and the 2016 NAACP Image Award for “Outstanding Talk Series.” The Talk, hosted by Julie Chen, Sara Gilbert, Sharon Osbourne, Aisha Tyler and Sheryl Underwood, broadcasts weekdays (2:00 PM, ET/1:00 PM, PT/CT). Produced by CBS Television Studios, the show was developed by Gilbert, who also serves as executive producer along with executive producer John Redmann. The Talk is currently nominated for six Daytime Emmy Awards, including Outstanding Talk Show/Entertainment and Outstanding Entertainment Talk Show Host. This month, CBS Daytime announced the launch of Not Safe For Daytime, an edgy new series of digital videos on its YouTube channel that highlights and promotes CBS Daytime’s popular programs. The webisodes include inventive original skits, pop culture parodies and viral video spoofs, and feature stars from across the entire CBS Daytime lineup.